Coyote View is one of my favorite spot on the land. It is a raised area of an ancient river bed that looks out from a slight rise on the land in the four directions with the east sunrise and the evening light being... well, illuminating. And there is absolutely no light pollution--benefit of having no neighbors. When I am a coyote, this is where I go to watch my family. It gives me perspective, peace, and a truly powerful sense of place. It has a campfire spot naturally arranged in the center of boulders that have been shaped (by the Mother) into chairs, chaise lounger, table, and benches. There is a nearby river access point, enough developed flat areas to accommodate a couple of tents and 5-6 people. 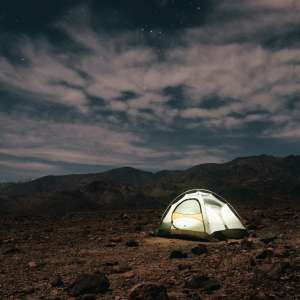 We'll provide five gallons of water and fire prevention tools (AGAIN, NO FIRES IN THE SUMMER OR FALL), communal composting toilets, and outdoor kitchen or use your camp stoves and simply stay clear of the house entirely for maximum seclusion. The toilets and kitchen are located near the house which is a 3-5 minute walk from the site. You can expect maybe one other campsite occupied. 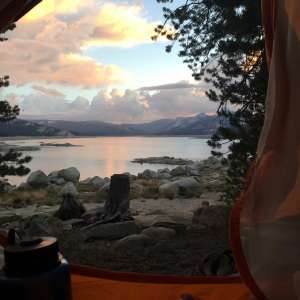 We seldomly choose to have more then two campsites occupied--we like or solitude as well. FIRES ONLY PERMITTED IN WINTER AND SPRING when fire restrictions are lifted. Bring your own wood. NO CHARMINE FLOWERS! 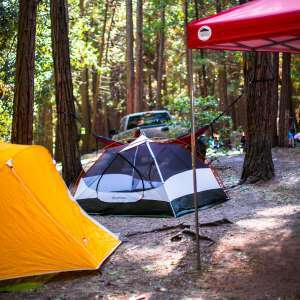 Peeing is fine away from trails and tent sites. Ladies, do not leave your TP behind, buried or otherwise. We will mail it back to you. NO DEFECATION EXCEPT at the Latrines, no matter your LNT expertise. All of our campsite guests are invited to help out in some way on the land, including restorative activity at nearby and faraway habitat restoration projects of WildPlaces, a local NGO that's ReWilding the Future. (Projects include tree plantings, trail building, invasive species removal, trash and gang tagging removal, meadow restoration, seed collection, water quality monitoring, public outreach, and more.). Do it! Give an hour or two. Mehmet will provide an extra amenities like a nature tour, campfire meal, or whatever is clever. Our interest in the protection and restoration of the land is strong and goes beyond even our love of having guests. So your service to the lands and waters is part of the "new recreation" that must adapt to increased human impact on...well, everything. In other words, outdoors recreation now requires that we not only manage our own impact but must also take a bite out of someone else. 2. How far off the land are you willing to travel to a restoration site? Stay on the land, drive ten minutes, drive one hour. 1. 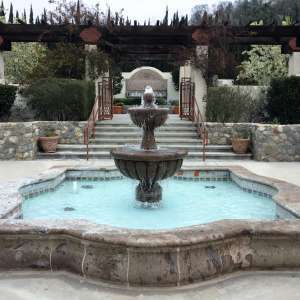 Car park is 5-7 minute walk from Coyote View. For belhop service, stand at a mirror and meet your sherpa. 2. You take your recycling and trash with you off the land or take it to the house and give us $5 to deal with it. Micro-trash (like a tiny piece of tin foil) is also trash (like a big nasty car tire). Not be negligent. 3. Kitchen supplies are available and should be cleaned, washed, AND put back on shelves. We have small fridge, toaster oven, kettle, microwave (yuck), most cooking tools, wash station, compost and recyling station, and propane stove. Locate fire extinguisher open use of kitchen. Use the river. No soaps (biodegradable or otherwise) used in the river unless you use a bucket to carry water 10 feet away from river. We do have a hotwater outdoor shower available. Wifi is not always reliable ; however Springville is nearby and wifi can be found there. Have a question? Send Mehmet/Chico a message! We have very unique and special acreage set in the Giant Sequoia National Monument. A tour will not only get you oriented geographically and for safety, a 30-40 minute walking tour will anchor you in special features and activities on our land and surrounding places. 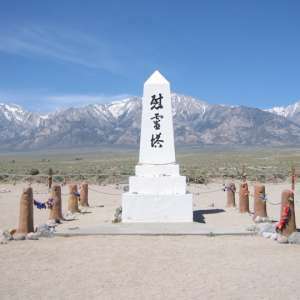 The tour includes the local and Sierra Nevada ecology, the Tule River, wildlife, wildflowers , and even wildfires, not to mention important Native American cultural features, the community of WildPlaces, spiritual and cultural ceremony and sweat lodge, birding, fishing, and art. 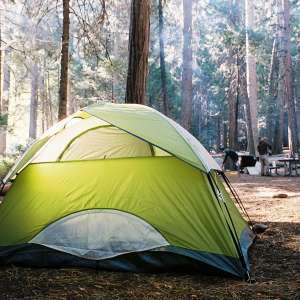 Natural features you'll find at Coyote View Tent Camping in California. 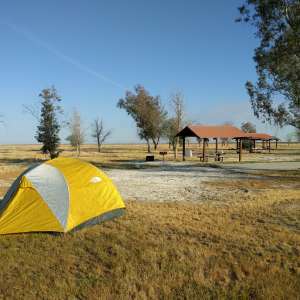 Coyote View campsite is located at the back of the property and is a slightly raised plateau that provides sweeping views of the surrounding countryside. 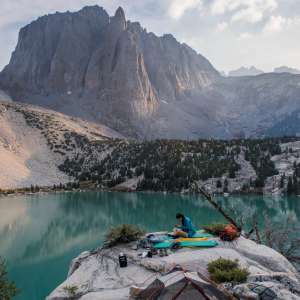 While Coyote View is a bring-your-own-tent type of site, there is a raised platform that could be used to place gear and probably even sleep on if you needed to. Coyote View campsite provides beauty and views galore, but you should be prepared to bring all of your other equipment. There is water available on site, but you should plan on bringing something to store the water and possibly even a portable shade for the hot summer months. This is a walk-in site, so be prepared to pack all of your stuff with you as you make your way out to Coyote View, but don't worry, it's less than 1/4 mile walk. 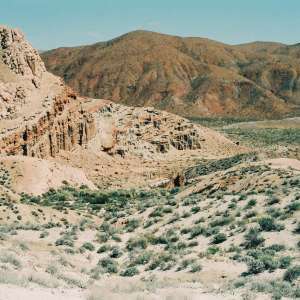 The Coyote View site is a great place to enjoy some solitude and to relax for a bit, but you are not expected to remain confined to your site while on your stay. Just a short walk form Coyote View is a path that leads down to the Tule river, which runs through the property and provides many areas to explore up and down the property. There is also a seasonal, communal firepit that can be used when the conditions are right. Mehmet and Chico (landowners) are kind enough to provide outdoor kitchen essentials at the main house and that is a great place to fulfill your cooking needs. There is also a very nice community dining area near the main house with many different areas relax and enjoy the property from. Not only is this a good location to use a jump-off for the high country, including Sequoia and Kings Canyon NP, it is a great weekend getaway spot that also offers land stewardship opportunities. Either way you look at it, this place should be on your list. This was a lovely site on some very lovely land. After days of car camping in crowded NPS campgrounds during the holidays, it was great to switch into backpacker-lite mode and sleep in a quiet field under the stars. Mehmet and Chico were welcoming hosts and we were grateful for use of the fire pit during the chilly nights. This place.... is soooo great!! Xico and Mehmet are great hosts and the atmosphere around the camp is amazing. I really would come here again. The view is beautiful! If you've fully explored and read the information on this listing page and still have questions, you can message Mehmet/Chico here.